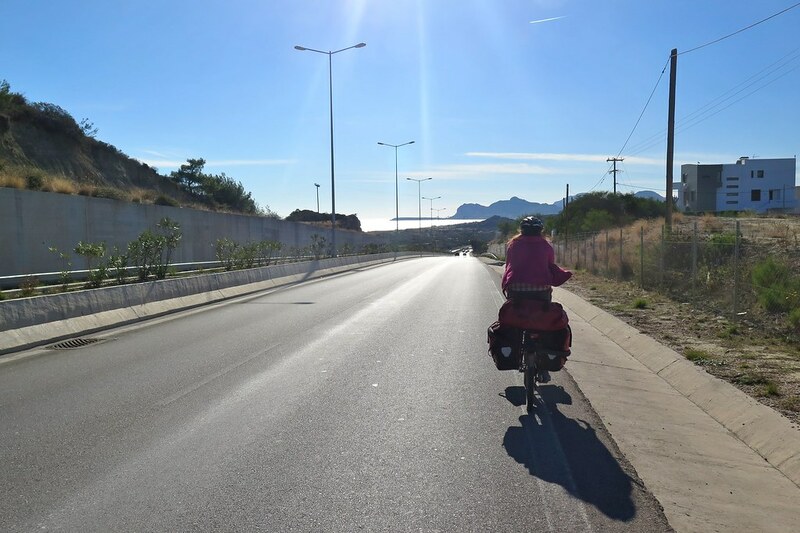 Fethiye to Marmaris is only about 125km, and we still had a few days until the next ferry to Greece, so more short cycling days were on the agenda. 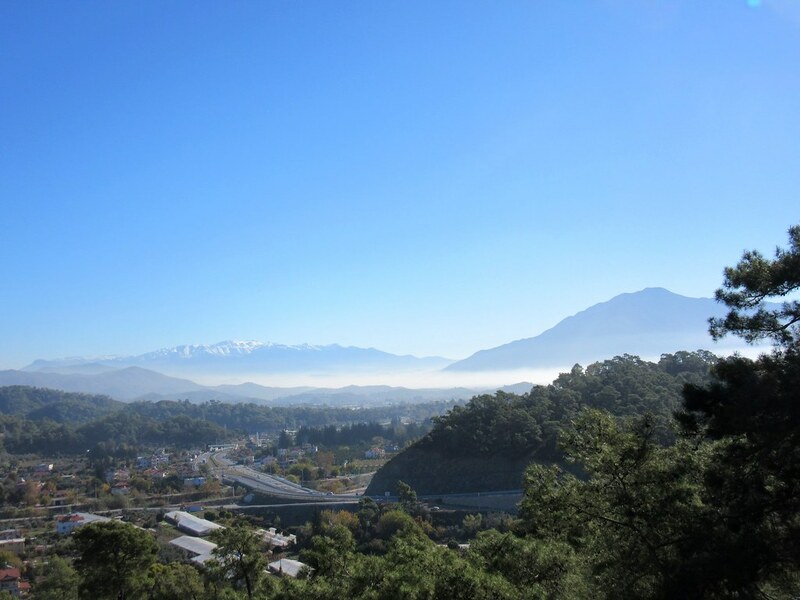 We left late in the morning with blue skies and fresh snow on some of the mountains back from the coast. 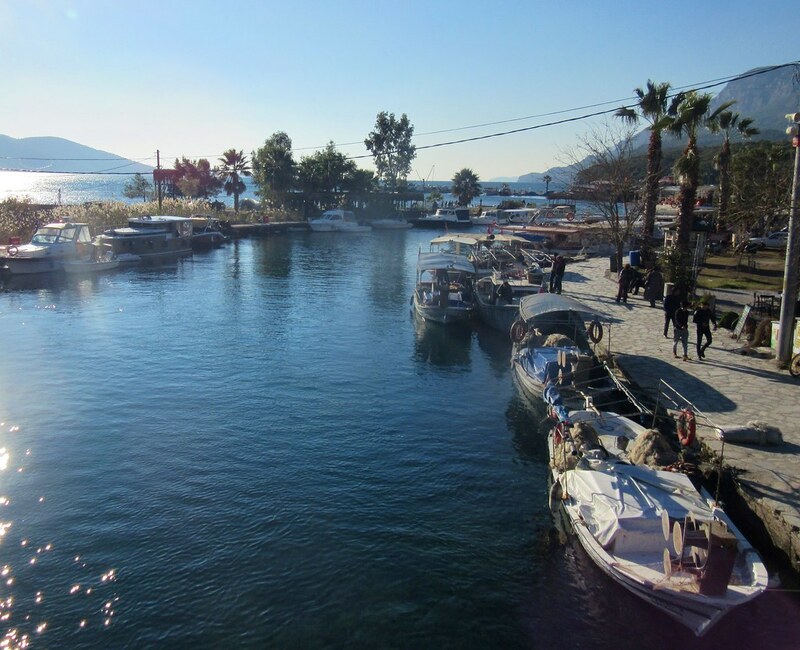 We were staying in the north part of Fethiye so we were quickly out of town. This road rarely goes above 200m altitude so on Google terrain maps, it looks quite flat. But there are lots of short ups between the inlets and looping inland following the coastline. Pretty soon we were climbing away from the sea, looking back at the morning mist hanging over the low ground. At the top of one of the climbs we saw two touring bikes ahead of us. We pushed to catch up and met up with Stephan and Yuili, from Germany and Taiwan, living their ‘Unlimited Travelling Dream’ (www.dreamunlimited.net). We’d been in touch before and expected that we’d probably run into them somewhere along this road. We’ve been following a very similar route, they set off from Hong Kong earlier in the year and have travelled through Central Asia to get here. We’re all heading in the same direction so we rode on together. 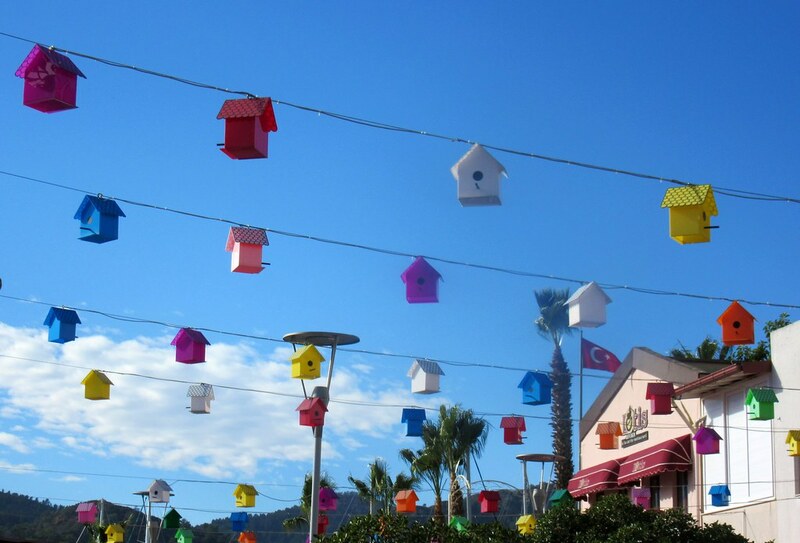 We stopped for a pide (Turkish pizza) in Gocek, where we sat under hundreds of painted bird boxes suspended from wires over the town square. On closer inspection, the holes are actually just painted on, not much use to any birds,. 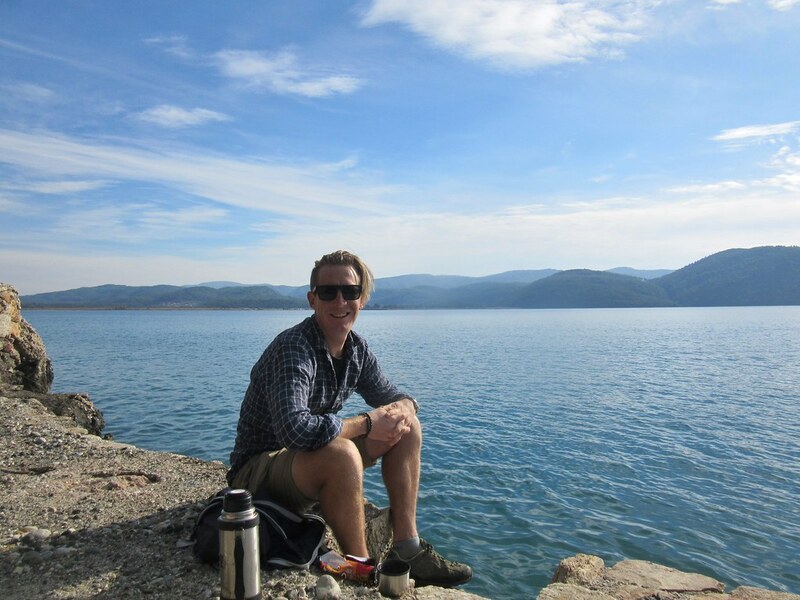 We planned to camp that evening at Koycegiz, where Annie and Paddy (the tandem cyclists who we met in Bishkek) had recommended a campsite. In the end, we didn’t camp there, we stopped short of the town, and found a spot in the pine trees looking down on the lake. We had crept ahead of Stephan and Yuili on a climb towards the end of the day. We waited for a while before we went off the road and pitched our tent, but we weren’t sure if they’d stopped earlier. We kept our eyes open for them once we’d set up, but we didn’t spot them. 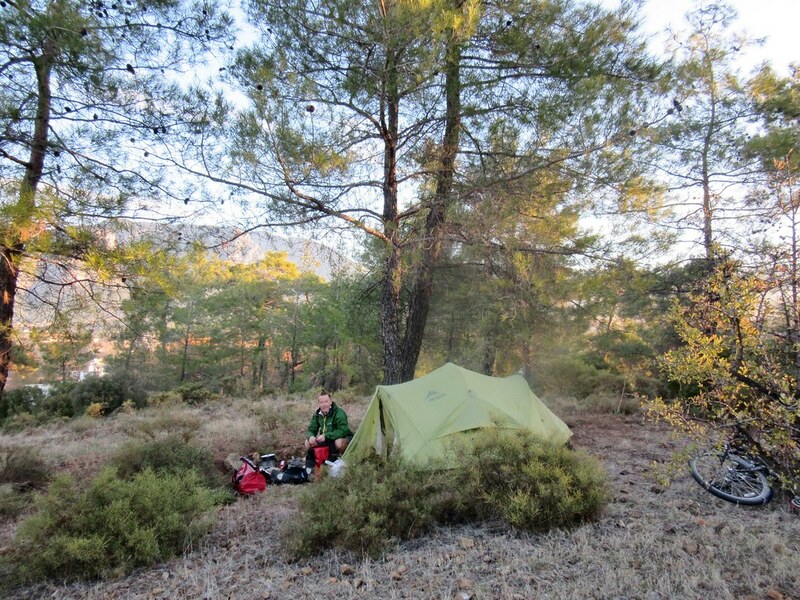 It was our last time camping in Turkey and a beautiful evening, even if the ground under the tent was slightly rocky. The next morning we caught up with Stephan and Yuili a few kilometres past Koycegiz. It turned out they’d passed us as we were setting the tent up and continued into town, after spending a bit of time looking for us. Sorry guys! They went on, then asked to camp in someone’s garden and were invited in to sleep in the house, so they landed on their feet. 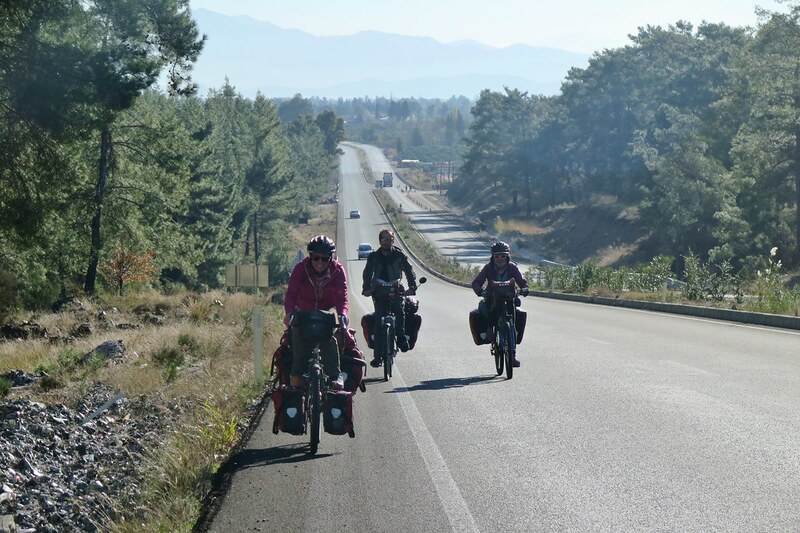 We rode together in the morning getting closer to Marmaris. 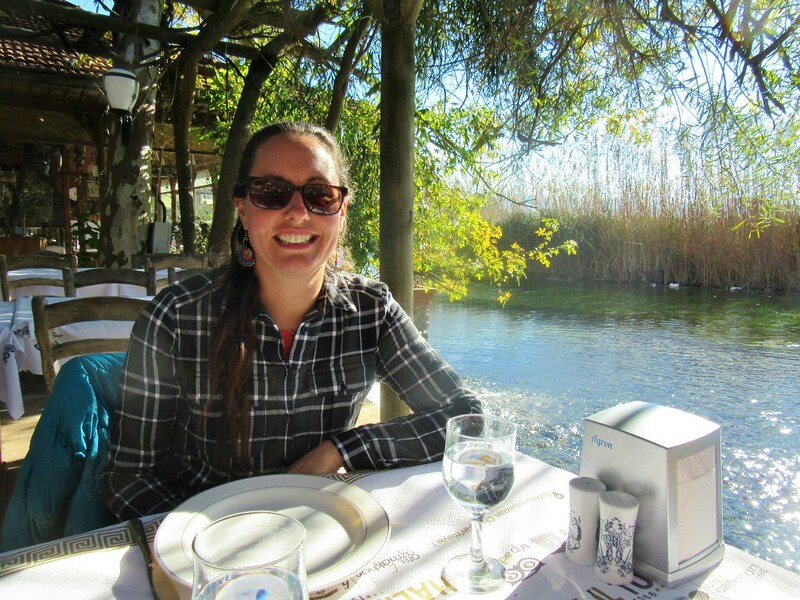 At lunch time, we stopped in at a little roadside cafe for more pide (I love that stuff!) and as we were leaving, another two cyclists rode up behind us. I missed their names, but they were from Switzerland and had ridden from China. They’d been travelling around the world, by various means of transport for a couple of years and were ready to get home. They raced ahead of us to catch a ferry to Athens and get back to Switzerland as quickly as they could. 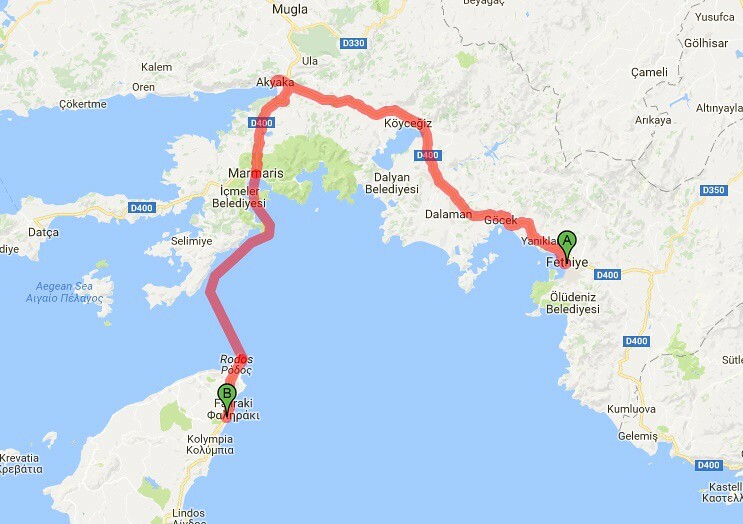 We split off from Stephan and Yuili at this point too, they continued directly to Marmaris, while we stopped at Akyaka, where we planned to have (another) couple of days off before the ferry. 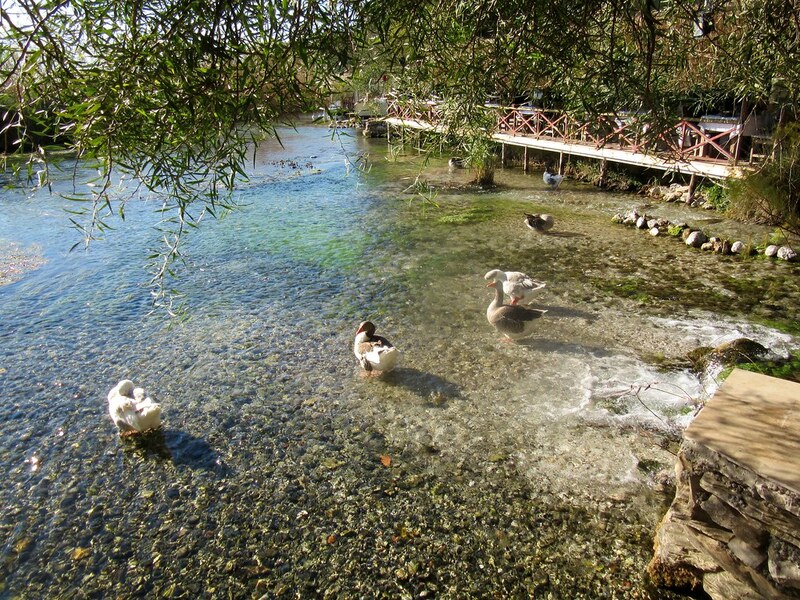 We’d picked it purely by chance as it looked like a nice place with a beach, and it turned out to be a real gem. 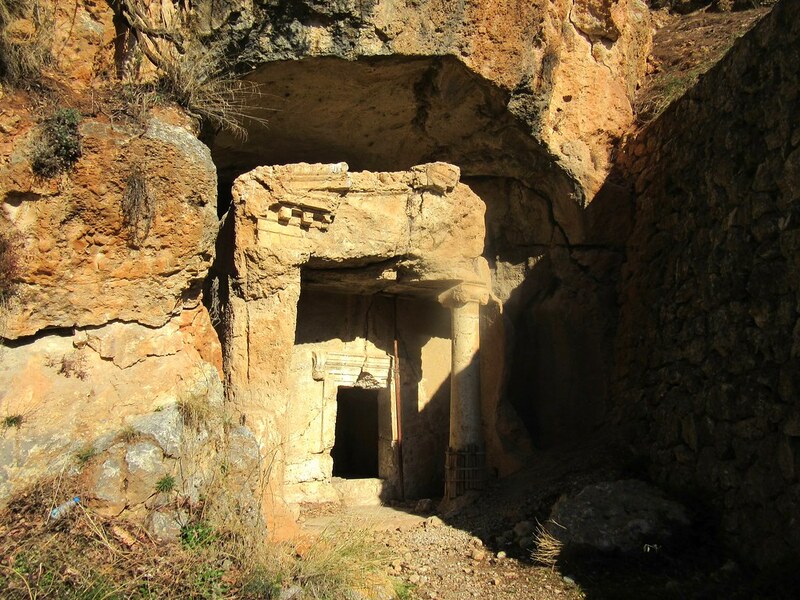 We rode in past a Lycian tomb carved into the rock, then next to a clear river which met the sea at a fishing harbour. The small town was beautiful, all the buildings are built in the same style, with whitewashed walls and timber roofs. 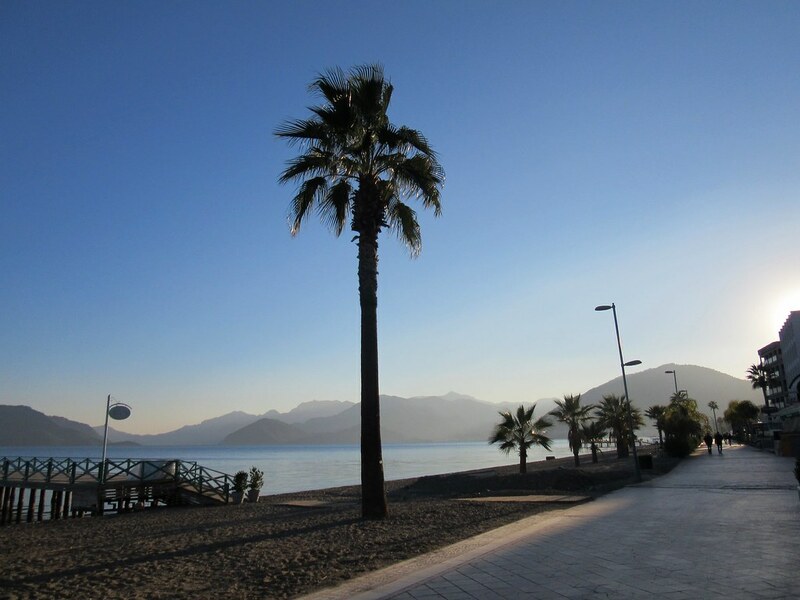 It felt a lot livelier than Fethiye and some of the other beach towns we’d passed. I think a lot more local visitors come here, so there wasn’t the same slightly sad, closed up, off-season feel that those places had. 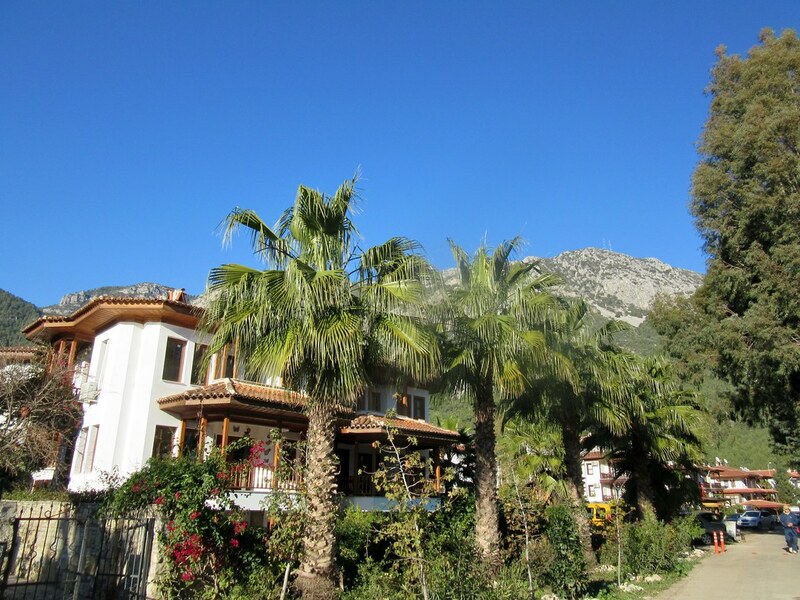 We only had a short up and over to get from Akyaka down to Marmaris. 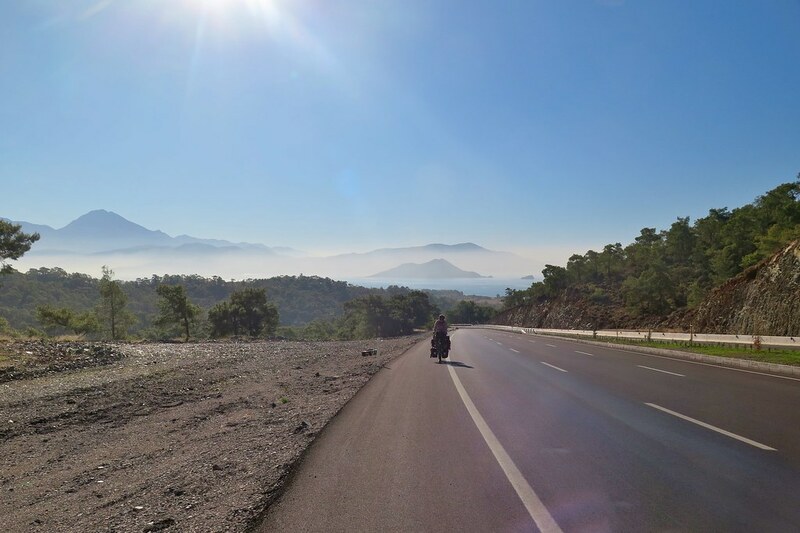 We backtracked for a few kilometres and then rejoined the D400, the road we’ve been following ever since we reached the sea at Mersin. 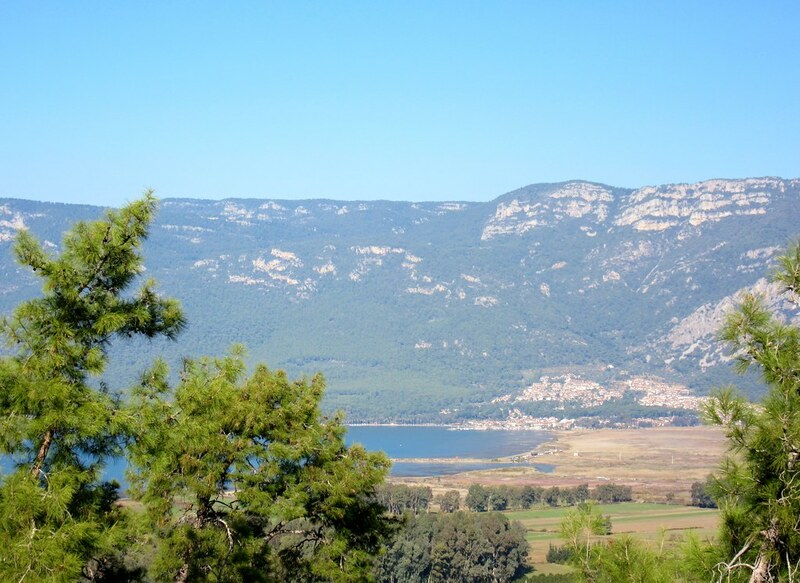 We crossed the flat river valley and then started up the hill giving us one last view back over the bay to Akyaka. The road took us through more pine forests, then one short steep section after about 20km got us onto the ridge with a long descent ahead of us. 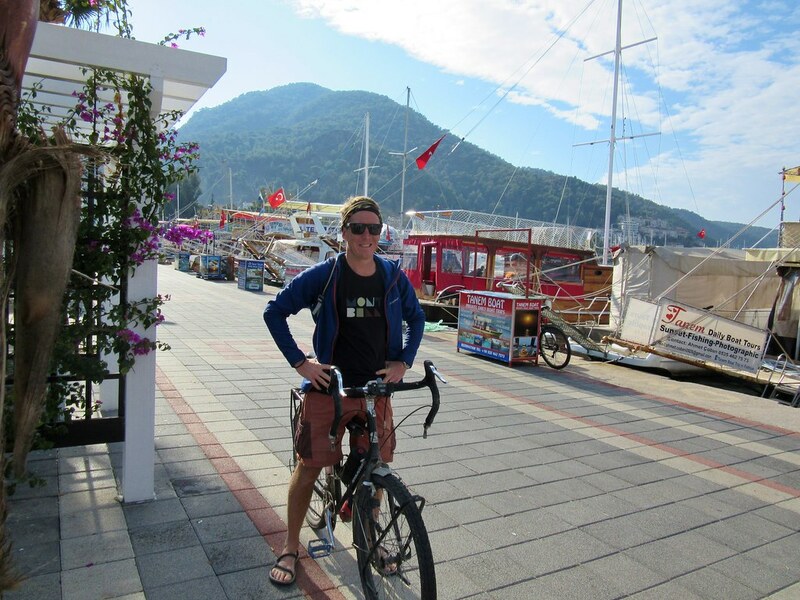 At the bottom of the hill, Marmaris, and we coasted into town early in the afternoon. 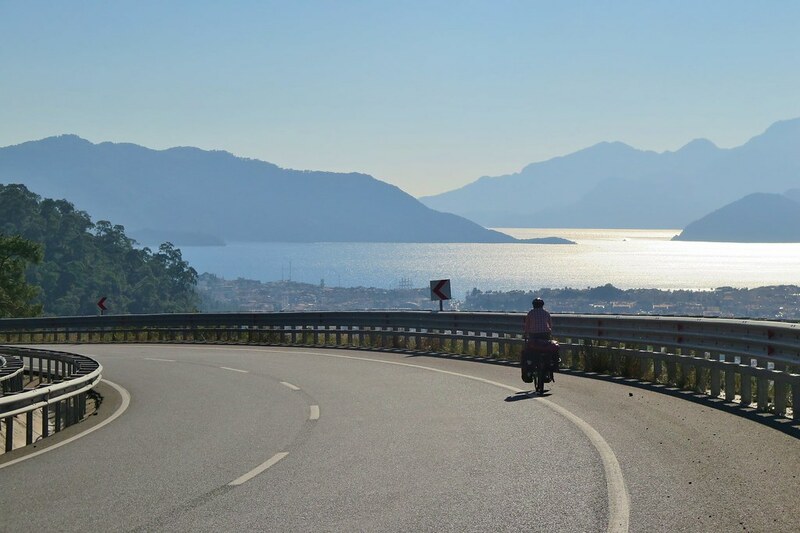 Many of the roads in the centre were closed off for road works but we rode along the seafront to a hotel where, I think, we were the only guests. The next morning the alarm went off at 7 o’clock which, at this time of year, is way before sunrise. 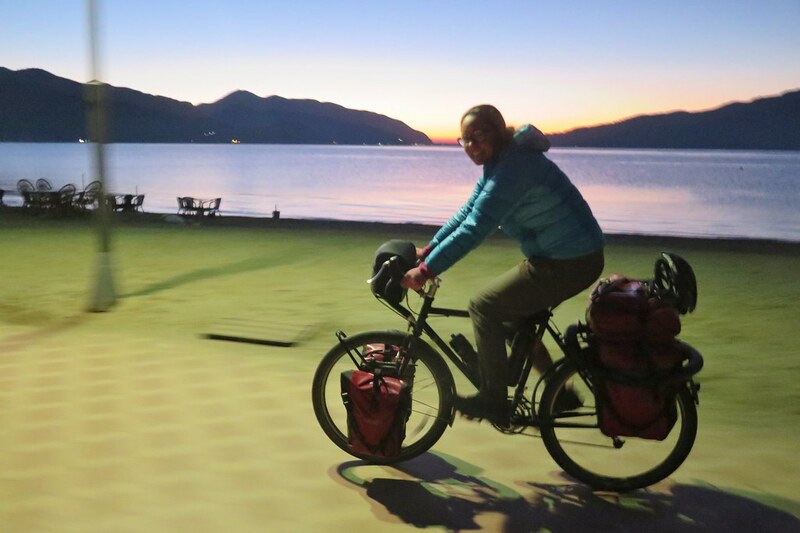 We packed up and left quickly, cycling back along the sea front in the dawn light. 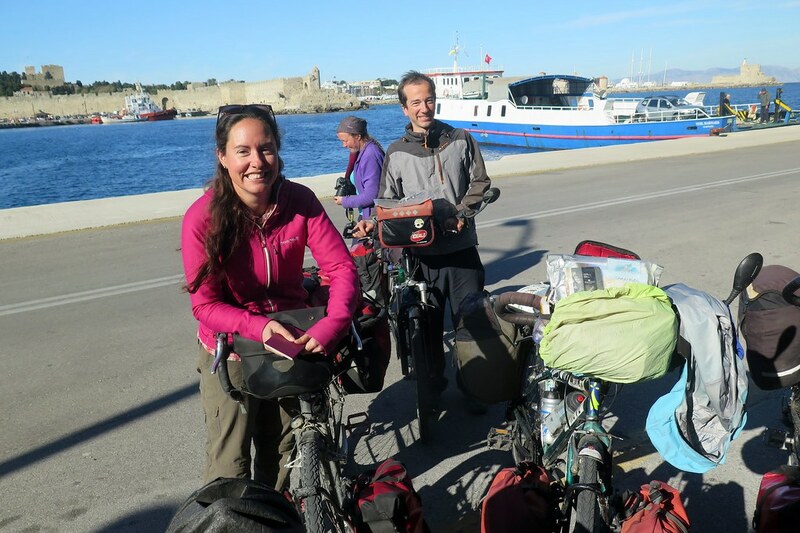 We got to the ferry port and met up with Stephan and Yuili again, and also saw another couple of cyclists, Elena and Gaetan from France. 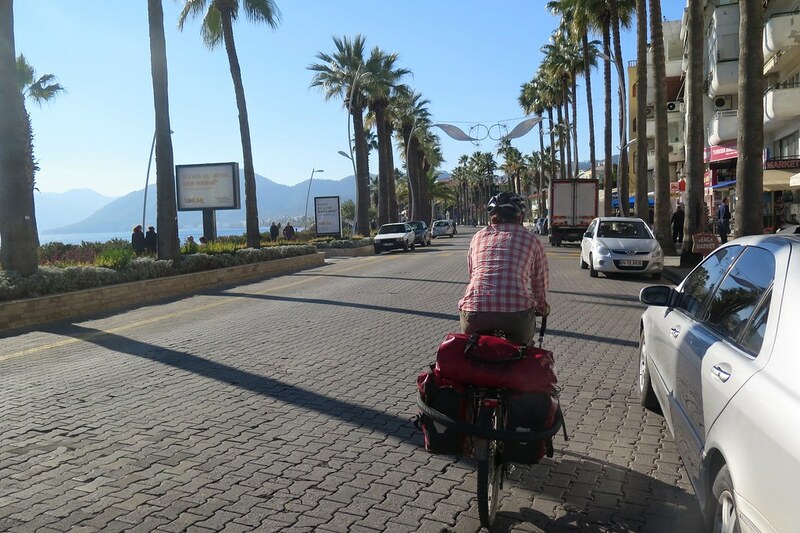 During the winter, the ferries only go every 3 or 4 days, and there are lots of cyclists racing through Turkey to spend their winters in Southern Europe. We went through immigration and got possibly the final stamps in our passport for this trip. 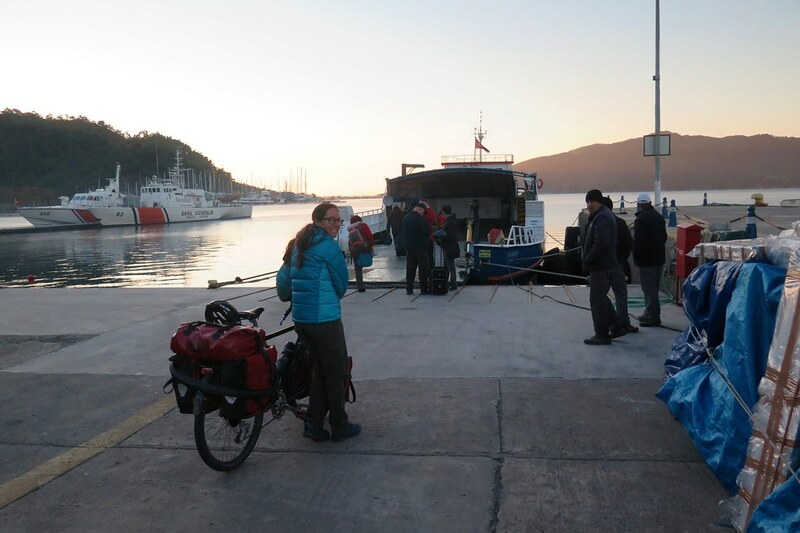 Our panniers were X-Rayed, then we boarded the ferry. This boat wasn’t quite like the car ferries or freight ships that we’ve been on previously. It looked more like a small barge, with enough room for 5 or 6 cars and maybe 50 passengers max. Even though it was the only boat for days, there were only about 20 other people onboard with us. We dozed for a bit and read during the 2 and a half hour crossing. 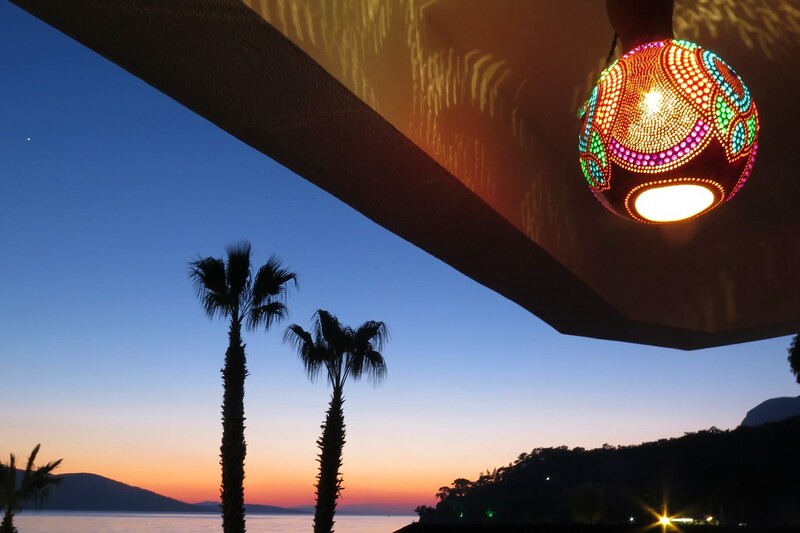 We stuck close to the Turkish coastline for most of it, before a short stretch across open water to Rhodes town, the port at the northern tip of the island. 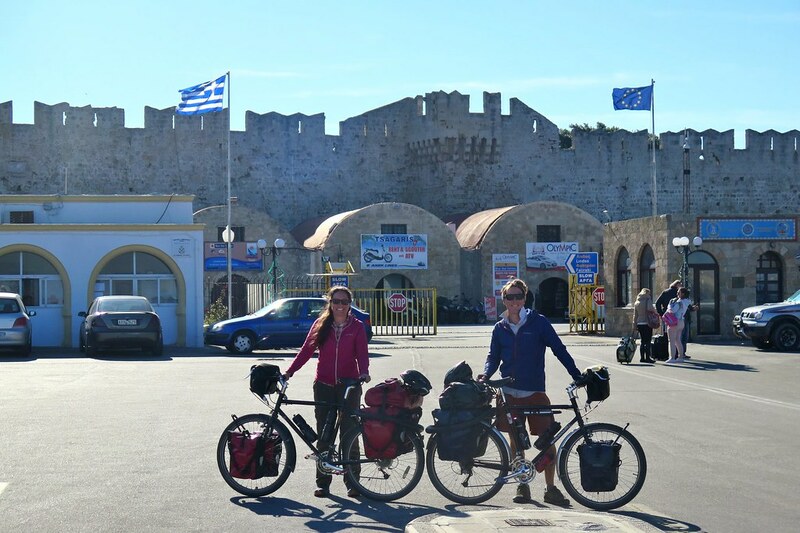 We rolled our bikes off the boat, and onto European soil for the first time. 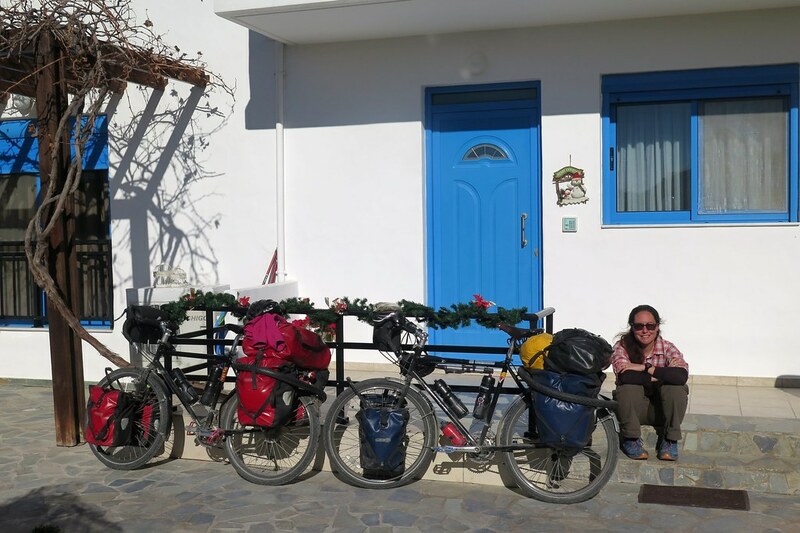 It was an exciting moment, we’d crossed Asia from east to west by bicycle and reached Europe. It’s the start of the home leg, kind of. We won’t be taking a straight line back from here, but staying south and close to the Med for the next few months. We breezed though passport control, then took a few photos infront of the European flag in the port before saying auf wiedersehen, zai hui and au revoir to our fellow cyclists and hitting the road. Getting through and out of the old town was a bit of a mission, on narrow one way streets in heavy traffic. 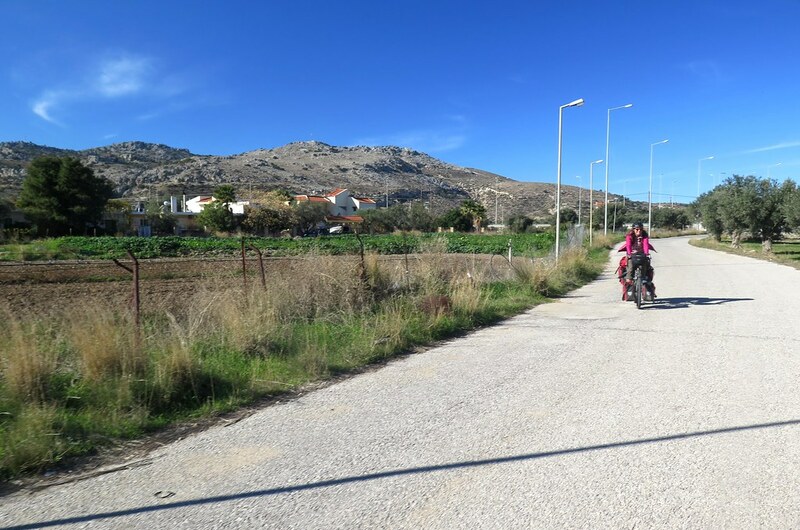 After a few kilometres we were through it, and onto the main road that runs down the east coast, towards Lindos. We passed through Faliraki, who’s name is familiar as a party town where Brits embarrass themselves on pub crawls, fighting, snogging and puking in the street (anyone remember ‘Club Reps’ the TV show?!). A few kilometres further on, we got to Afandou, where Clare’s lovely family have booked a villa. We found it without too much trouble and waited outside in the sun for the owner to meet us and let us in. Later in the evening, Clare’s Mum, her sister Emily, brother in law Matt and little niece Lilly arrived after flying down from the UK. We’ll be taking some time off, spending Christmas here with them, something Clare has been looking forward to for a long time. 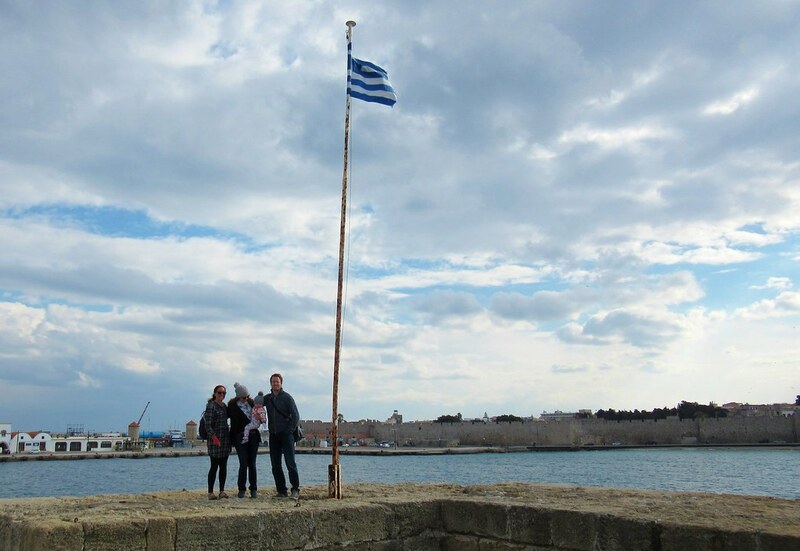 Greece is missing us ! 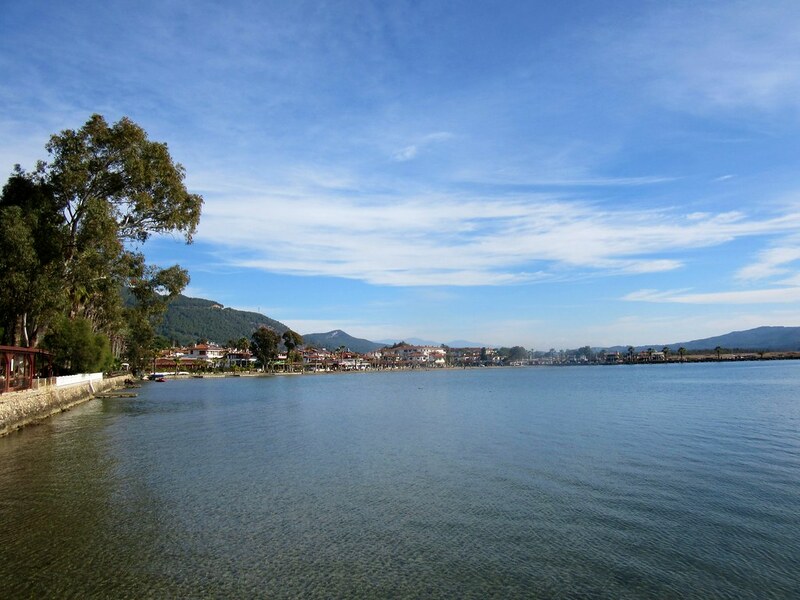 A so nice country. It’s funny, we met Stephan and Yuili in Tadjikistan. 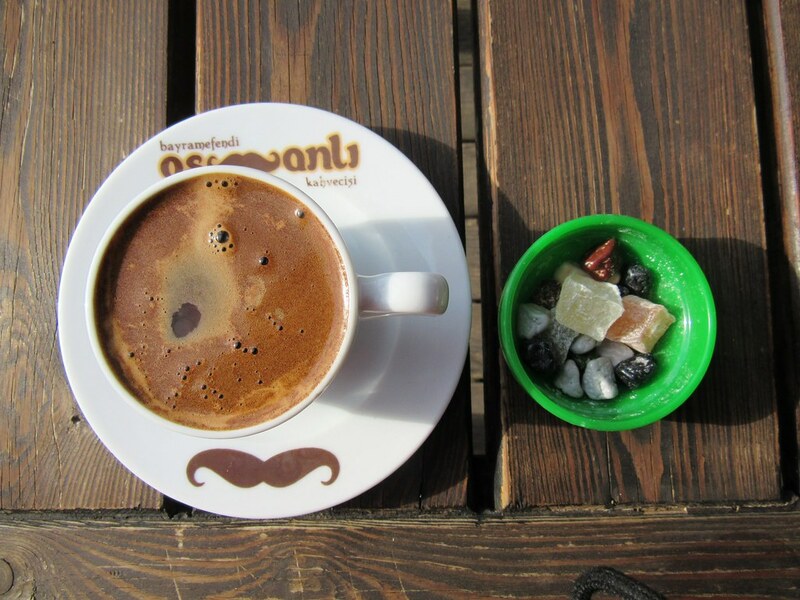 We met them for some minutes only, with a Bulgarian friend of them, but we had great time together. We are now in Japan. We enjoyed Kyushu island a lot, but the last days where not so funny because of the weather and the very busy road. Now we are on the beggining of Shimanami Kaido cycling path. It is looking much more funnier ! Thanks again for all the informations you gave us about Hokkaido ! It will be very useful. We think taking a train to go there in the beggining of january. Than, we will take the boat to go to Vladivostok ! We will be back in France in the end of february. If you’re not too fast, you won’t need any warmshower host in Paris, we will be there for you ! If Paris is on your plans before going in the UK of course ! I hope you get nice weather for the Shimanami Kaido, it’s lots of fun. Shikoku in general is great too, hopefully the roads down there should be quieter, especially in the south. Enjoy snowy Hokkaido! 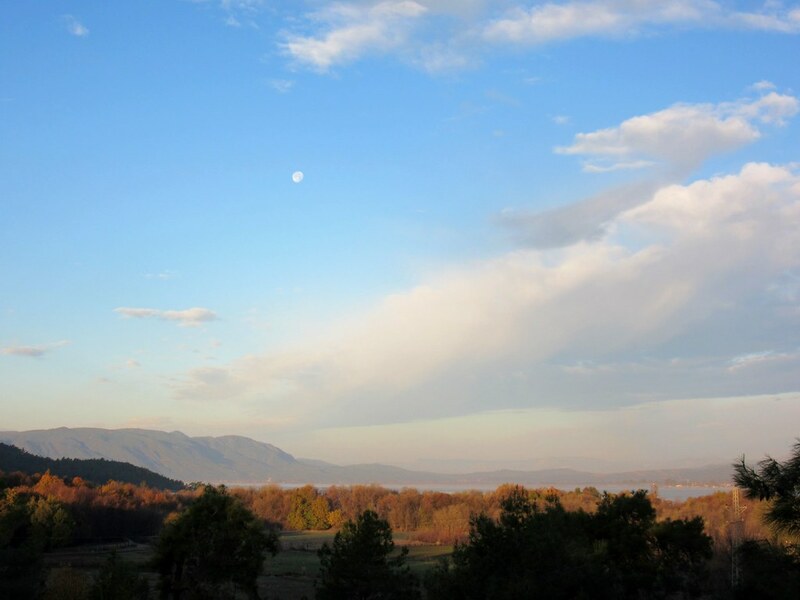 We’ll probably be passing through France in the spring or early summer, so we’ll keep in touch! Merry Christmas! Great read guys and congratulations for arriving to Europe! Enjoy your ‘vacation’ and family time. We’re heading to NZ for a month tomorrow and really looking forward to summer there. We’ll keep following your adventures through Europe in the new year. Hi Maya! Happy holidays to all of you! Have a great time down in NZ! We were down there a few years ago at this time of year, it’s a really beautiful place. Will you be cycling? Yes, we are cycling. Started from Auckland yesterday and going north. 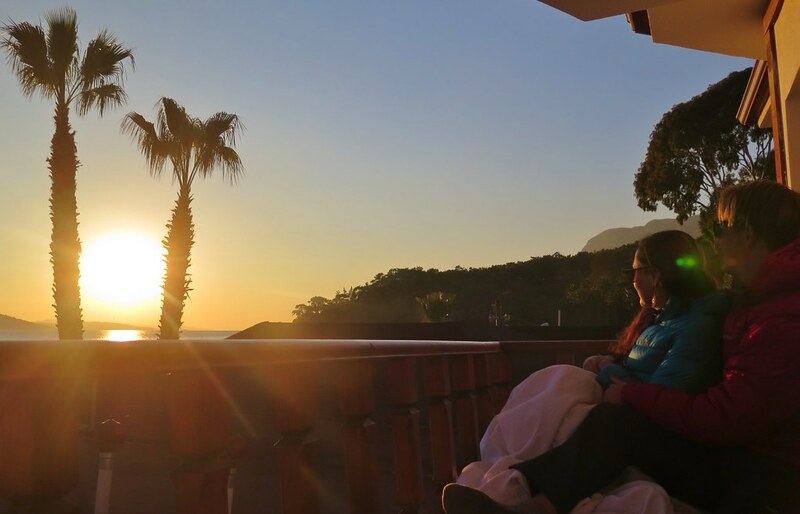 We are taking it quite easy though with all the hills and an almost 2 years old… and we want to spend some time in nice beaches along the way. It’s nice 22 degrees almost every day and the days are long, very different from Vancouver this time of year. Hope you are enjoying your relaxing time.